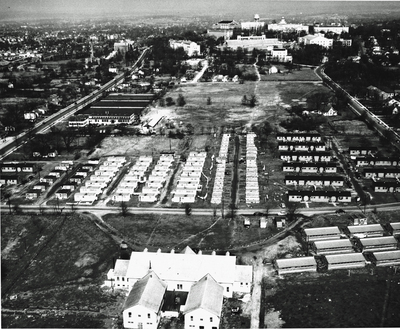 Garrett stated that because of the low government rent of $15 per unit allowed by the Federal Public Housing Authority under the reimbursement plan he desired to exercise the option of the college to purchase the 33 houses and laundry including furniture at $1 each and to sign a bailment contract to rent the nine double trailers and laundry units at $1 per year for a total of $34. In turn the houses were rented out for $25 and $30 per month. The single trailers for $18. There was also a section where students could park their personal travel trailers. WKU also built ten metal barracks to house single men. Once set up and inhabited, the village was divided into four districts. The citizens elected a mayor, alderman-at-large, district aldermen and four district fire marshals. The wives' were offered noncredit cooking courses. Lester Reeves opened the Vets Village Market in the right wing of the Agricultural Pavilion and the village started a nursery for small children.